The residents of Bamni were fed up with the constant feud between two farmers in their village. Their quarrels, which often came to fisticuffs, went on day and night, at home and in the farms, for years. Occasionally their neighbours had to rush them to a doctor after they had injured each other. But in February, the hostility disappeared like a whiff of smoke after the road passing between their fields, encroached for farming, was cleared. “They have forgotten their legal battle over the encroached area and are beginning to remember that their wives are first cousins,” says Sachin Bandapalle, a farmer of the village, with a chuckle. Village-to-farm roads are a rarely mentioned but vexed problem for revenue departments all over the country. Roads remain encroached upon, sometimes for generations, as most encroachers are big landowners or politically well-connected farmers who use their influence to derail anti-encroachment drives. But the success of the drive in Bamni village of Latur district in Maharashtra was due to a rare display of the administrative will. In fact, in the past two years the district collectorate has cleared 2,500 km of farm roads in about 570 villages in Latur. What is more, farmers raised the entire cost for the drive—over Rs 12 crore. Since there is no scheme for clearing encroachments from farm roads, and prescribed procedures are too complicated and ineffective, Daole, in consultation with farmers groups, decided to undertake the anti-encroachment drive funded by farmers. And they were more than willing to raise the approximate Rs 50,000 per km required to clear encroachments, level sunken roads and dig roadside trenches for drainage. The administration shouldered the responsibility of dealing with vested interests and offered the land measuring and road-marking services for free. Speed was essential for the drive to succeed, explains Mandar Vaidya, subdivisional officer of Nilanga. To ensure that the measuring and marking work did not go waste, which happened in the first few instances, the officials made it a point to start marking only when the village funds were collected and earthmovers hired and ready. The machines for encroachment removal actually followed a few hundred metres behind the surveyors marking the roads, he adds. Villages responded to this proactiveness by accumulating funds at a record speed—sometimes lakhs of rupees were collected in a matter of days. Transparency was taken care of as officials never handled cash. Farmers raised the money and made the payments. But Daole stood firm. The district political top brass supported the drive across party lines. They were fed up of the endless infighting due to road feuds. “In village meetings, we had explained that opposition to the drive would not be tolerated. Still there were instances where senior officials, police or I had to intervene,” Daole says. Vaidya recalls one such incident in village Aajani. A big landowner lay before the earthmover and held up work for 10 hours. The village residents were too much in awe of him to oppose. Vaidya reached the spot and gave him an hour before calling the police. He sprang up. The news spread and opposition in other villages died down swiftly. The success of the initial roads was followed by demands for similar work all over Latur, and the administration resumed the drive in November 2010. The cleared roads are a relief to the farmers in more ways than one. Balaji Manmode, sarpanch of village Kharola in Renapur tehsil, says earlier most farmers had to carry fertilisers, seeds and tools to farms in head-loads since there was no space for bullock carts or tractors. Neither could they transport their produce to the market in time. In absence of roads they used to carry their produce through other farms, and had to wait until standing crops in those farms were harvested. Their produce would remain covered in plastic sheets in the farm for months, resulting in losses from theft, mice or even stocks catching fire, says Manmode. As per an estimate by Latur farmers, they used to incur losses to the tune of Rs 125,000- Rs 175,000 per hectare (ha) annually. Post road clearance, in villages like Khopegaon, sugarcane acreage doubled this sowing season. 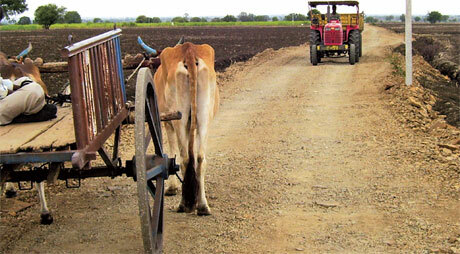 Farmers have widened the existing roads in most villages through land donation. 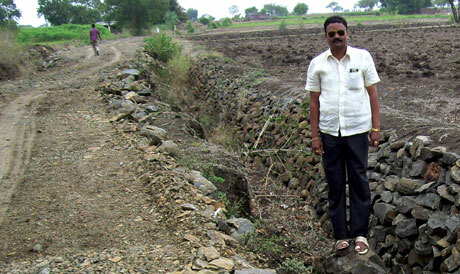 In Khopegaon, where land price ranges from Rs 125 lakh to Rs 175 lakh per ha due to its proximity to Latur city, farmers donated up to one hectare each to widen an eight metre road into a 33 m one and built a new road. The drive has also benefitted the administration. Law and order problems arising because of road feuds have come down, reducing the workload of mamlatdar courts (tehsil level revenue courts) and rural police stations. “These roads will never be encroached again,” says Vaidya, “as people have endured so much trouble freeing them.” The administration and farmers now plan to create tree lines along the roadside trenches to prevent re-encroachment. The article written is very nice and it will help the other villagers from such hardships due to unavailability of farm roads.I want to contact Aparna Pallavi for more information regarding the farm roads and its encroachments and how to tackle this.